Amritsar: For years, Darshan Singh, a 45-year-old green grocer in Amritsar, rented a pushcart for Rs400 a month to hawk fruits and vegetables. Last month, Singh got a free upgrade thanks to Bharti Wal-Mart Pvt. Ltd.
Singh doesn’t have to pay rent any more and his shiny new tricycle cart allows him to thread his way through Amritsar’s neighbourhoods with greater ease. 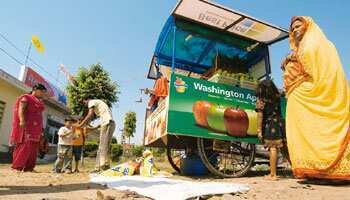 The cart itself is emblazoned with advertisements for Washington Apples, USA Pears and California Grapes, courtesy Best Price Modern Wholesale, a Bharti Wal-Mart venture, for which this is a part of a corporate social responsibility (CSR) initiative. Bharti Wal-Mart, which opened its first Best Price Modern Wholesale store in Amritsar in May, distributed 10 of the carts to hawkers last month. SCS Group, the Gurgaon-based firm that promotes the Washington Apples Commission, the California Table Grape Commission and the Pear Bureau Northwest in India, says it bought ad space on the 10 carts presented by Bharti Wal-Mart. “We pay for advertising inside the Bharti Wal-Mart store," said Rachna Sharma, head of communications and strategy at SCS. “Similarly, we have bought space on the carts too." Sharma declined to specify the money spent on advertising. “We often partner with companies on CSR initiatives, as we did with Coke (Coca-Cola India Pvt. Ltd) for plantations inside the premises of the Best Price store," a Bharti Wal-Mart spokesperson said in an email. “The carts were donated to their owners." Bharti Wal-Mart said it has received a positive response to its CSR venture and plans to scale it up, though it didn’t provide any details. Bharti Wal-Mart is a 50:50 cash-and-carry wholesale joint venture between Bharti Enterprises Ltd and US-based Wal-Mart Stores Inc. The carts come with proper licences that allow them to ply legally. The vendors are also given membership of the Best Price store, although they don’t restrict themselves to the outlet. For the more affluent people, “we buy from Best Price. For locals, we buy from the mandi", Kumar said. Bharti Wal-Mart has not faced the sort of protests that greeted some of the other firm entering the field. ITC Ltd’s plans to sell fresh produce through pushcarts invited the ire of existing small businesses in many cities, forcing it to abandon the venture. Owners of small shops in Amritsar dismiss the Bharti Wal-Mart venture as a publicity stunt. “They are just doing it to become famous," said Narendra Kumar, a local green grocer.